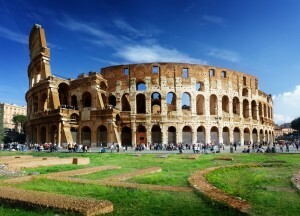 Imagine being in Rome near the Colosseum. Imagine being hungry. Imagine looking for something special to spend a couple of hours tasting Italian Cooking. Close to the Colosseum, not far from the charming Roman Forum’s archaeological area, you’ll find exactly the place you are looking for. The warm atmosphere will take you to a typical “taverna” where tradition and quality meet each other to give you a unique experience. The bright and cozy Italian restaurant near the Colosseum offers the opportunity to have lunch and dinner as well as the possibility to organize little party for you and your guests. The Italian restaurant offers a wide range of typical dishes. Starting with appetizers like panzerotti with mozzarella and anchovies, Switching to vaccinara rigatoni and a lamb cutlets, you can taste our home made flavors, enjoying the kindness of our friendly staff. Since the end of last century, generation after generation, every cook, giving his own special contribution, made Taverna dei Quaranta a special oasis for tourists in love with Rome as well for local people glad to find a trice to give rest to daily stress. King of our Italian restaurant is the beautiful wood-oven, every evening turned on to bring out our thin and crispy pizzas. Forget about frozen pizzas and industrial pasta. Here you’ll relish the intense taste of our genuine ingredients, daily produced by our reliable suppliers. You can choose between traditional pizzas like Margherita, Capricious, Biancaneve and our special pizzas, created thanks to the creativity of our chefs. Don’t lose the Contadina: on a delicious mozzarella bed, spicy sausages marry Italian broccoli, with a tasty topping of salted ricotta cheese. A catering service is also available for our clients. Directly from our kitchen, our Italian creations will be the success of your parties and your celebrations. Our well-trained staff will give you suggestions about every detail, from menu to decorations, from music to seating organization. Restaurant experience you have ever lived.